Hello! I hope you all had a wonderful weekend! It's the start of a new week, and today I have a card for the final October Viva La Verve challenge.. I was happy to be able to play in all four challenges this month.. a first for me in quite awhile! The challenge was to use the sketch (see below) and to use whatever inpires us this fall / Halloween season. October is Breast Cancer Awareness month, so I decided to pull out the Verve set, Believe. $10 from the sale of every set to Susan G. Komen for the Cure. I pulled out my Think Pink specialty papers from Making Memories. Instead of an image, I simply used the sentiment, "You Give Me Strength". I stamped 3 of the flowers from the same set onto one of the solid pink papers from the collection, cut them out and popped the layers on top of each other. Finally, I added some stitching and some frosted pink pearls from Pizazz Aplenty. I have a brand new Believe set which I am also offering up as Blog Candy for my belated 2-year Blogoversary. If you would like the chance to win this lovely set, please leave a comment on this post. I will draw a random winner on Thursday, 10/28, when I draw winners from my post below as well! Accessories: Standard Rectangle and Big Scalloped Rectangle Nestabilities (Spellbinders), Pearls (Pizazz Aplenty), Foam tape, Thread, Sewing machine. Another beautiful card! Thanks so much for sharing it! 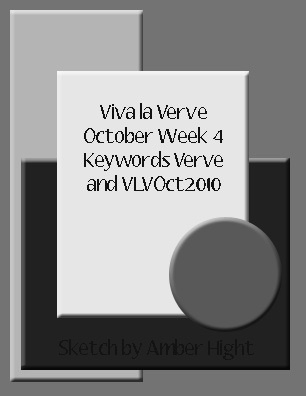 What a nice thing for Verve to do! I would love to win this set - thanks, Stephanie! Wondeful Stephanie, love the colors.. 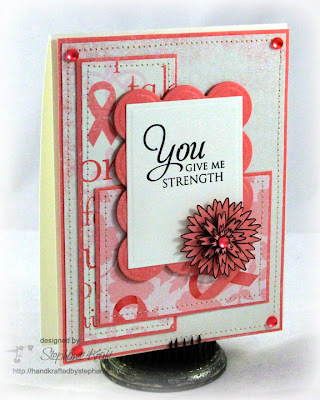 Wonderful use of the sketch and love the papers and flower! Beautiful card.